Sudan’s President Omar Hassan Al Bashir was indicted by the International Criminal Court in 2009 for allegedly being responsible for war crimes and crimes against humanity in Darfur. The African Commission on Human and Peoples’ Rights (African Commission), Africa’s main human rights body, recently published a decision holding Sudan responsible for the arbitrary detention and torture of three prominent Sudanese human rights defenders. Osman Hummaida, Amir Suliman and Monim El Jak were detained and tortured by Sudan’s National Intelligence and Security Service (NISS) in November 2008 for their alleged support to the International Criminal Court’s (ICC) investigations into mass atrocities perpetrated in Sudan’s Darfur region. They left Sudan shortly after their release, fearing for their safety. The African Commission found that there were no effective remedies in Sudan to redress the violations suffered by the three complainants, and in any case, the authorities had failed to investigate or take any steps to remedy the harm caused. It also found that Sudan violated the African Charter on Human and Peoples’ Rights when it forcibly closed the Khartoum Centre for Human Rights and Environmental Development (KCHRED), of which one of the complainants was Director, and froze the organisation’s assets on account of its perceived links with the ICC. It would be an understatement to say the case was, and remains, politically sensitive. The ICC was investigating, and subsequently issued arrest warrants in 2009, for sitting President Omar Hassan Al Bashir, two other senior officials and a pro-government militia leader accused of war crimes and crimes against humanity in Darfur. A more recent arrest warrant, detailing three counts of genocide, was issued for Al Bashir in 2010. Hummaida, Suliman and El Jak – three friends and colleagues – were detained for three days in November 2008. Their interrogation and torture at the hands of Sudan’s security centred on the whereabouts of alleged evidence proving they had supported the investigation against Al Bashir and his officials. Although they could name some of the perpetrators involved in their detention and torture (after three days of torture, Hummaida was taken to meet with the then head of the national security, Salah Gosh) the African Commission made no findings of individual responsibility. This is because, unlike criminal tribunals such as the ICC that make findings of criminal responsibility for serious international crimes like torture, the African Commission focuses on state responsibility for violations of human rights law. In its decision, the African Commission called on Sudan to investigate and hold the alleged perpetrators to account, pay compensation to the complainants, and re-open and unfreeze the bank account of KCHRED. It gave 180 days for Sudan to provide notice of steps taken to implement its recommendations. The decision is important not least because it comes from Africa’s leading human rights body. Unlike international human rights bodies set up by the UN that have been criticised (rightly or wrongly) for imposing western norms on states, the African Commission monitors human rights standards negotiated and adopted by African states. The problem is that states do not have a strong track record of implementing recommendations of the African Commission, and there are few avenues for ensuring compliance. It has been described as a “paper tiger”: a monitoring body without teeth. Its decisions are quasi-judicial, meaning they are not binding, and it has no enforcement powers. Added to this, the African Commission has long been neglected within the African political system. It was not referred to in the AU Constitutive Act and thus does not enjoy status as an AU organ. It is under-funded and its Commissioners have bemoaned insufficient staffing and resources to implement their mandates. In theory, if a state fails to comply with its recommendations, the African Commission can refer the case to the African Court on Human and Peoples’ Rights, which does issue binding decisions. Yet just 24 out of 54 AU member states have accepted the jurisdiction of the court – and Sudan is not one of them. The African Commission can also report to political organs of the AU on state compliance with its decisions and these do have enforcement mechanisms. In the case of Sudan, the possibility of state compliance with African Commission decisions therefore rests largely on political factors, and the weight given to them by the AU’s political organs. The key political consideration for the AU is the balancing act between the implementation of agreed human rights standards and the principle of non-interference in the internal affairs of states, enshrined in the AU Charter. Sudan, until now, has benefitted from near-unified support for the latter within the AU as well as from key members of the UN Security Council. This truth is no better illuminated than with the ICC file on Darfur that the three human rights defenders were accused of supporting in 2008. As ICC Prosecutor Fatou Bensouda recently attested to in an emphatic statement to the UN Security Council, there has been painfully little progress in the Darfur case since 2009. Responsibility for this failure relates not only to the non-cooperation of Sudan but also the failure of the UN Security Council to enforce the ICC arrest warrants. 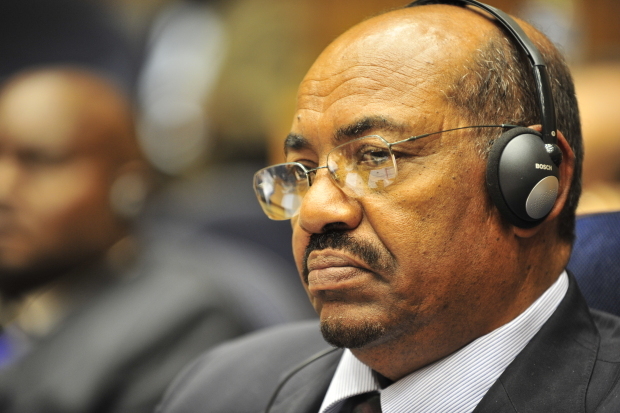 Bashir has travelled to a number of countries in Africa and the Middle East since the warrants for his arrest were issued, emboldened by the support of countries such as China – a permanent member with a veto – that can effectively bar coercive Security Council action when states fail to effect the ICC arrest warrants. Bensouda warned in December that this inaction serves to “embolden perpetrators to continue their brutality” and pleaded for Security Council support to apprehend Al Bashir, a “fugitive from justice”. At the regional level, the AU has repeatedly called for non-cooperation by its member states and for the AU states with treaty obligations toward the ICC (there are 24) to renege. In January a resolution of the AU commended the Democratic Republic of Congo for failing to arrest Bashir during a state visit and questioned the wisdom of prosecuting African leaders, reaffirming its belief in the immunity from prosecution of “sitting Heads of State and other senior officials during their tenure in office”. From the beginning, the AU has also contended that the ICC investigation will disrupt on-going peace processes in Darfur. Meanwhile, six years on from the indictments, peace remains illusive and civilians bear the brunt of conflict that continues to rage and grow more complex. In December and January, more than 20,700 people were newly displaced from their homes in North Darfur state alone. Outside Darfur, targeted attacks on civilians by government ground and air forces in the South Kordofan and Blue Nile states since conflict erupted between the Sudan Peoples Liberation Army-North (SPLA-N) and Khartoum’s government in mid-2011 has received woefully little international attention. Although reliable figures are difficult to obtain, an estimated 940,000 people are thought to be in need of humanitarian assistance in these areas. The lack of international interest and information on Sudan can in part be blamed on the routine denial of visas to international journalists and the daily harassment faced by the local media. A growing list of issues is subjected to censorship, including the armed conflicts. On 16 February the entire print runs of 14 Khartoum newspapers were confiscated by the NISS before morning distribution without reasons being given. In a recent Washington Post interview, Bashir denied the reports of ethnic cleansing, mass killings and rapes in Darfur that are the basis of the ICC investigation, claiming the process is purely political. What is clear is that the implementation or otherwise of human rights commitments made by states is a deeply political game that until now has shielded those responsible for mass atrocities in Sudan from the reach of justice. The recent African Commission decision finding Sudan responsible for the arbitrary detention and torture of the three human rights activists for allegedly supporting the ICC investigations represents an important recognition of the harm they suffered, and the systemic failures in human rights protection in the country. Sudan’s compliance with the African Commission’s decision, including its call to hold the alleged perpetrators to account, will require significant pressure both from the African Commission itself by way of follow up, and from civil society calling on African leaders to uphold the authority of home-grown human rights institutions. Against this backdrop it is easy to feel pessimistic about the trajectory of human rights protection mechanisms in Africa, and specifically the human rights crisis in Sudan. Yet Sudanese human rights defenders and activists show remarkable resilience and determination. Shortly after their release from detention and their flight from Sudan, Hummaida set up the African Centre for Justice and Peace Studies (ACJPS) a campaign organisation dedicated to monitoring and promoting human rights and law reform in Sudan. He directed the organization until his untimely death in 2014. Suliman leads the legal work of the organisation from exile, pursuing redress for countless other Sudanese torture survivors. Katherine Perks is Programme Director at the African Centre for Justice and Peace Studies (ACJPS) based in Kampala, Uganda. She is a human rights advocate with a special interest in equality and non-discrimination. She previously conducted research and developed policy and campaign positions on human rights at Rights of Women, The Equal Rights Trust and Amnesty International. How can you be a ‘fugitive from justice’ (Omar Al Bashir) when the justice system in question (THe ICC) has stated they are holding off on investigating you any further. Should someone have an arrest warrant endlessly without investigation or be allowed to get on with the business of trying to run their country and live their life, maybe restore peace as he has shown himself to be attempting to do along with economic stability prior to standing down int he future a he has personally stated? How long is considered fait to be either held with out charge or charged but then no investigation? Surely this itself contravenes justice.